Kick up your heels with Silverheels horehound! Silverheels horehound is an extremely versatile and low maintenance groundcover that looks absolutely gorgeous in all seasons. It forms mats that can be 2 feet across and only about 6 inches in height. The medium green foliage is haloed in silver, proving that even great plants have a silver lining. The undersides of the leaves also can be silver to white making a striking texture for the dry loving border. Silverheels thrives in well-drained dry soils and soaks up as much sun as you can give it. 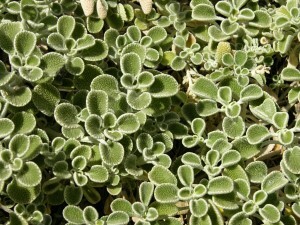 It is native to south facing slopes in the dry mountains of Turkey where it gets extremely cold and windswept. Flowers are really not much to speak of and may be sheared off to keep the mat looking at its best. Marrubium is a member of the mint family. 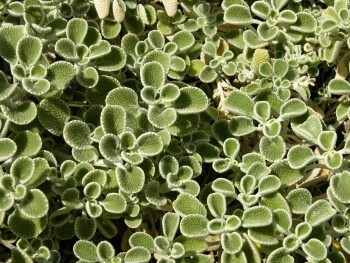 The foliage is wooly and soft to the touch. This plant makes for some great combination plantings with dry land shrubs and bulbs. One of the most stunning combinations for a contrast in feel and appearance is to have it grow as a “skirt” underneath the large cholla plants native to southern Colorado. This evergreen plant makes a remarkable difference to the winter landscape with its blanket of growth. Silverheels horehound is a great solution to those dry and neglected portions of the garden as well as a centerpiece when planted in even the choicest locations in the garden. Thanks to Mike Bone, Denver Botanic Gardens, for writing this piece. I’m interested in getting this for SE Alberta. How can I get it in Canada?